Motorcycles have long since fascinated those with an adventurous and free spirit and those who are always chasing a thrill. While many make use of motorcycles these days as a means of combating the rising costs of fuel and the equally rising traffic congestion in city centres, others still do so in seek of the adrenalin rush only motorcycle riding can provide. Join us as we go on a journey of discovery about the motorcycle racing circuit. Learn about the different types of races there are, the surfaces they are raced on and gain tips on how to best navigate your bike on these surfaces. 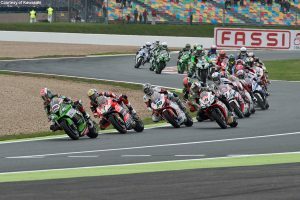 Enjoy some useful information on MotoGP and the teams that have reached the top. Take a walk or ride on the wild side and share in the experiences of those who have defied odds and taken speed to levels never before reached. Discover the design best suited to high speeds and how different surfaces affect speed and stopping. Motorcycles are machines of wonder, however, they deserve a degree of respect that only one who rides them will understand. They have the ability to take you to places that you never dreamed, however, in the same breathe they can destroy you. Having the knowledge of how to navigate on each surface will prepare you for the monstrous adventure ahead. Not all bikes were made for tar roads, take them where they belong. This exhilaration is shared with all the wonderful sports enthusiasts who live for the next ride.